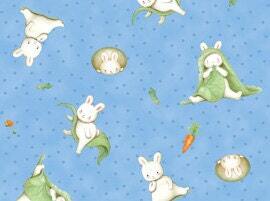 A fun childrens fabric blue Multi Tossed Animal Coordinating Cotton Print Fabric of Who's A Bunny Fabric by Quilting Treasures. A beautiful addition to the cotton cloth book panel. Add coordinating fabrics and created a one of a kind baby gift. Cute, cute, cute!! Thanks so much. May God Bless.